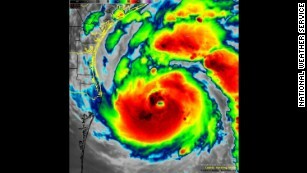 Hurricane Harvey is a good reminder for every pet owner to review their emergency preparations. Even if you don’t live in hurricane territory, there’s always a chance natural disasters can hit where you live. It’s a good idea to tune the NOAA Weather Radio to your local emergency station to hear the latest reports of weather in your area. And if you’re watching weather conditions where friends and family live, the FEMA app allows you to track National Weather Service reports from five different locations anywhere in the US. Have a plan! This 2-page checklist from the CDC is one of the best I’ve seen; print a copy and keep it with you. 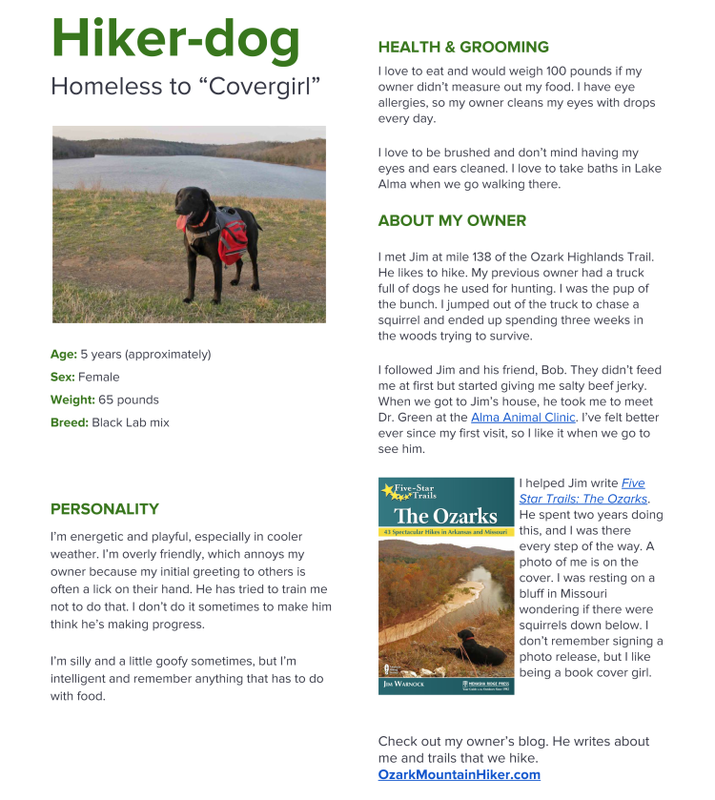 For more resources and information about pet-focused disaster planning, check out https://www.cdc.gov/features/petsanddisasters/index.html. 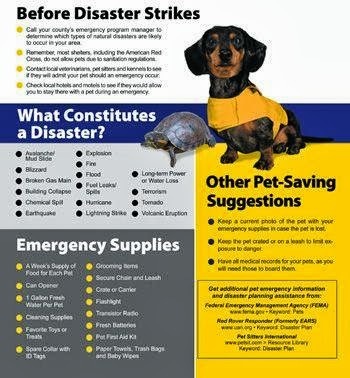 Pet-friendly evacuation sheltering can be planned and executed in a multitude of ways. In some communities, the human evacuation shelter is within the same room, facility, or campus as accommodations for pets. This allows the animals’ owners to have a large role in caring for the pet. In other communities, the human shelter and pet shelter may be in separate locations. In this case, evacuees are told where to bring their pets, while they will be staying at a shelter for people. If you will need to go to a pet friendly shelter during an evacuation, make sure you have the following items ready to go for your pet: a leash and collar, a crate, a two-week supply of food and water, your pets’ vaccination records, medications, and written instructions for feeding and administering medication. If your favorite four-legged friend is feline, be sure you bring kitty-litter and an appropriate container, too. Identification: Microchips are one smart way to ID your pets. My Sasha and Buddy The Wonder Cat are both microchipped and registered with AKC Reunite. Make sure you complete your registration and keep your contact info current. Take photos now of your pets. Photograph them standing, left and right profiles, and face-on head shots. Take additional photos showing you with your pets. If you can tag or add metadata to each photo, that’s even better. (To learn how, click here.) Save copies to Dropbox and/or email them to yourself and others. That way, if you lose your phone or computer, you can easily retrieve them. Build your own “Go” bag. 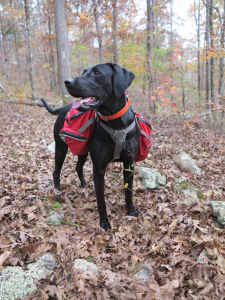 Use a backpack or small tote to stash extra kibble, leashes, collars, and basic first-aid supplies. Collapsible bowls are a great addition and don’t take much space. Put paperwork in sealed plastic bags, and make sure to include your name! Keep it handy so you can grab and go. If you have space in your vehicle, add extra jugs of water, tarps, ropes, and bungees. If you’re evacuating on foot, roll up the tarp and fasten it to your backpack with those ropes or bungees. If you are stranded on the side of the road or have to camp outdoors, you’ll be able to rig up a basic shelter to shield you and your pets from the weather. Communicate! Let family, friends, and co-workers know your plans. Social media can be a great tool to help you stay in contact. And have a back-up plan, to include alternate routes and destinations. And remember: cell towers and Internet providers may be impacted by disasters, so share that info ahead of time. Wherever you are, I hope you’ll take time today to review your own disaster preparation plans. Safety first!